On your mark, get set, PARTY! 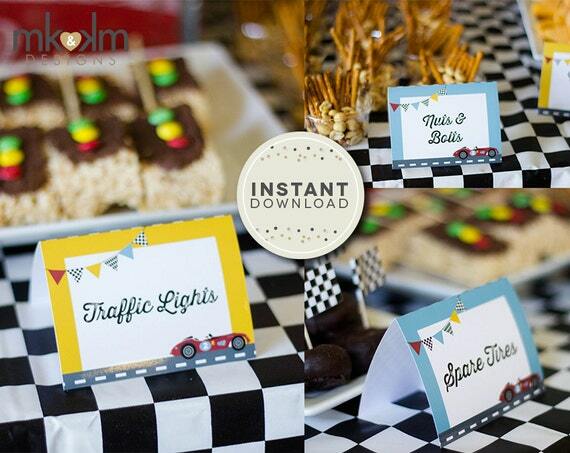 This listing includes 6 pre-customized food cards for you to use at your racing event! 4 food cards ( Spare Tires, Caution Cones, Nuts & Bolts, and Traffic Lights ) and 2 drink cards ( Motor Oil and Antifreeze ). If you need customized cards or would prefer blank cards send us a message! Instant downloads make it easy! Simply download, and print at home or your favorite print shop. ►Listing Includes DIGITAL JPEG and PDF files for 6 pre-worded Tent cards for you to print at home. Wording is as shown in the photos. Nothing will be physically shipped. JPEG files are included in a zip folders. Zip folders can only be opened from a computer. If you would like to add custom wording or change the number on the car please contact us for a quote.